Loved it, hope she continues this, on....hint hint!!! What I like best about Trinity's stories are that they're menage and PNR a big win win for me. 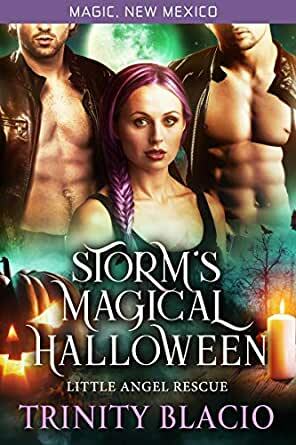 Trinity Blacio just has the knack for putting a story together that fit the characters to a T.
Storm just a sassy as she wants to be and with so much love to give she is an amazing character. I loved little Alex!. Storm's Dad kinda confused me a bit, not Doc but her real dad. Fancy Nolan's mom? was amazing! as well as Darla. The males Matty and Nolan were the typical alpha males, growly and hot. ( I didn't read the stories before) I'd like more about Matty and Nolan, because well yeah they rocked. 5.0 out of 5 starsWow! Just WOW!! Storm and Matty have come so far. Nolan is just what they both need. I love this series. The story flowed and the characters captured my heart! As soon as it popped into my kindle I was turning the pages and getting pulled into the story. Now a re-read and then the wait for the next book. I can't say enough good things about author Trinity Blacio! Her stories are rich and full! The characters capture your heart and bring you along for their story!